*Thank you for visiting KUBOOZ Store. We are specializing in jewelry design and making. *And you can click our brand name which on the top of the title; you can find more jewelry making with high quality and reasonable price. 3 Pair same size pulgs With Gift Packing. Designed and made by KUBOOZ.Pls click KUBOOZ brand find more new design. 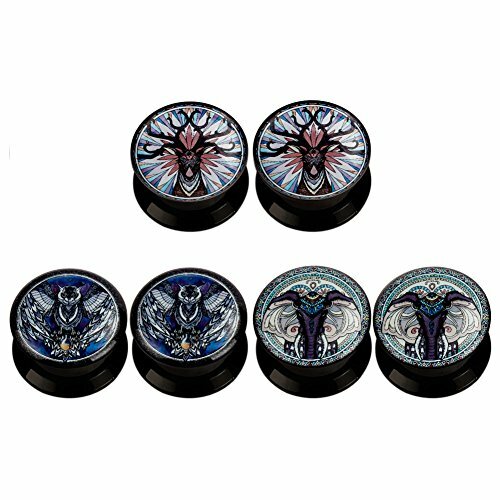 Unisex Condition Screw-Back fit tunnels, easy insertion and removal! KUBOOZ(1 Pair) Dangle Lightweight-plastic Pendant Jewelry Shine-gems Surface Stainless Steel Screw Ear Plugs Tunnels Gauges 2g to 5/8"